Fun 'N Games at first glance looks like a kid's game. Okay so it is but some of this game is actually kind of fun for a few minutes. 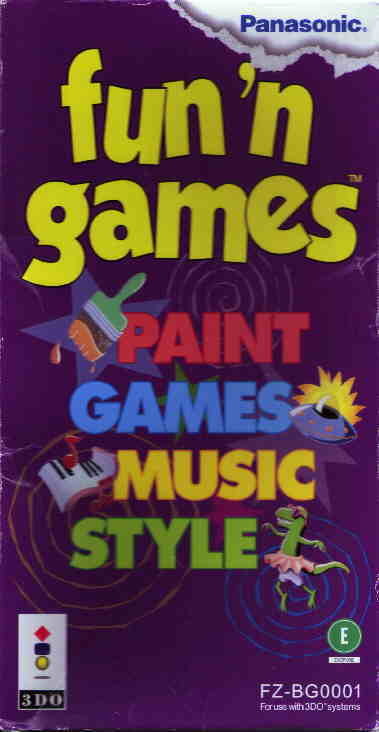 There are many little mini games: Paint(with lots of options), a music game where you can make or listen to music, a dress up game where dress some people up, and games(pac man clone, space shooter, memory, submarine shooter, and a puzzle game). This game isn't very good when it comes to the paint program unless you have a mouse which makes it much easier. Nothing real special but good enough for what this game is. The graphics on most of the games are average just like all the graphics in all the other sections of this game. That music make game has pretty many instruments. As well as gobs of well-known songs. The music in most of the games is good too but the actual music section is what makes it. It's hard to be precise in the painting without the mouse. But in the pac man game it is really hard with the mouse. So you gotta switch back and forth a lot in this one. The sheer amount of stuff you can do could really keep a wee one busy but otherwise it is still a little fun to play the pac-man game. Most of everything is all right but not great. An okay game if you got time to kill but definitly not a must have unless you love painting cheesy coloring book pictures. But hey, if you find Fun 'N Games for a couple of bucks I'd get it espescially if you are dying for a game to try your new 3DO mouse out on.